ASPerceived is a magazine for the digital age. 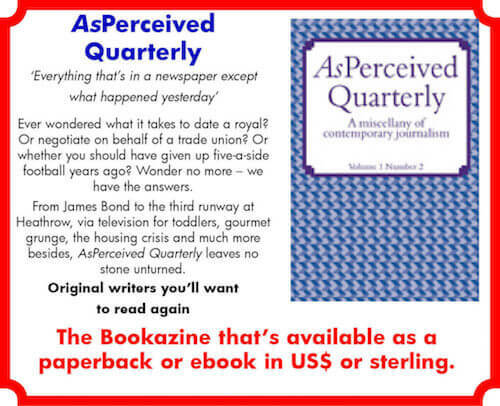 The title reflects the editorial approach – that the material reflects how the writers and contributors perceived what is happening around them. With so much information circling the world in the 21st century, events are greatly influence not by what actually happens but by how those events are perceived. Material posted is intended to be challenging rather than threatening, stimulating rather than offensive. Please close the anti-spam gaps when copying-and-pasting these addresses. Copyright (2000 – to date) remains with the creators; all rights reserved.